I’ve been neglecting my blog lately, but it’s been for a good reason. With a new baby arriving soon I have a ton of stuff to do and not much time to get it all done. Being on the computer has taken a back seat until I get all my “honey-do” jobs done. The deadline used to be AJ’s due date (May 9th), but now I’m having arm surgery (April 2nd) so I’m starting to panic. After the surgery my left arm will be immobilized in a splint for two weeks and once it’s off I still can’t do much for several weeks. There’s a lot to do, and not just the usual getting ready for baby things. To make room for Andrew’s nursery, Zack and Josh will need to share a room and that means new furniture. I don’t have the time, the tools, the materials, or the skills, but I’m just insane enough to try and make it all myself. I don’t know if I’m just stubborn or a special kind of stupid, but I’m determined to make this work. 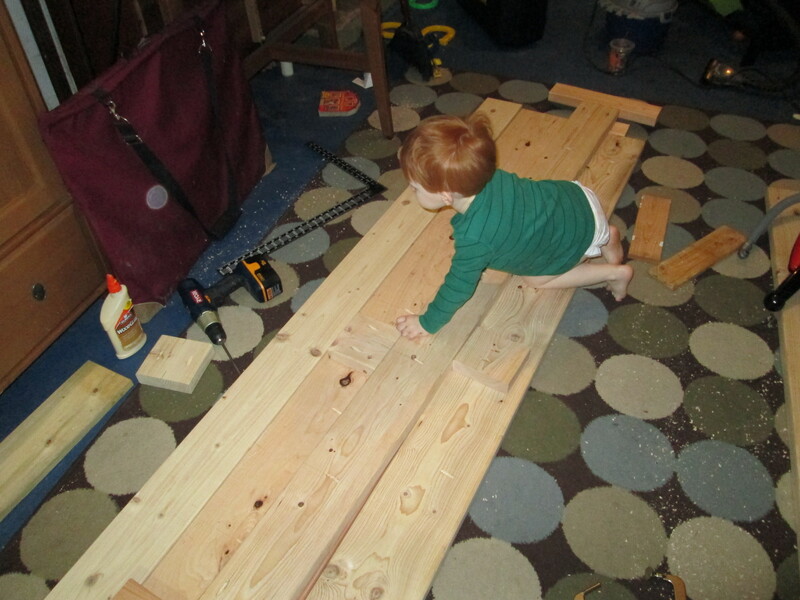 Josh “helps” me measure and cut the side rails on his big brother’s bed. Zack will get a loft bed with stairs and Josh will have a brand new “big boy bed”. Both of them will be extra-long twins and as indestructible as possible. I’ve been working on the beds every weekend and any spare minute I have. My bum arm and lack of carpentry skills has bogged things down a bit. 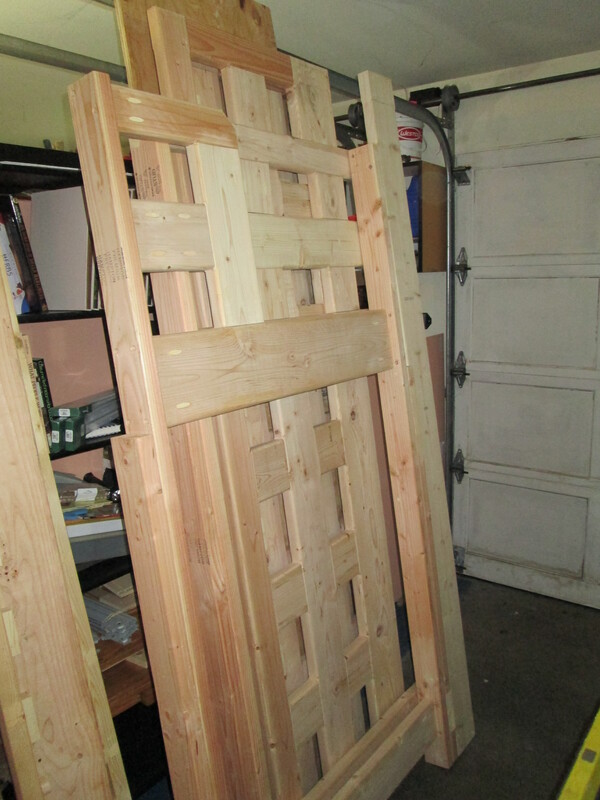 Built entirely out of 2x6s and 2x4s, Zack’s bed frame disassembled waiting to be sanded and stained. 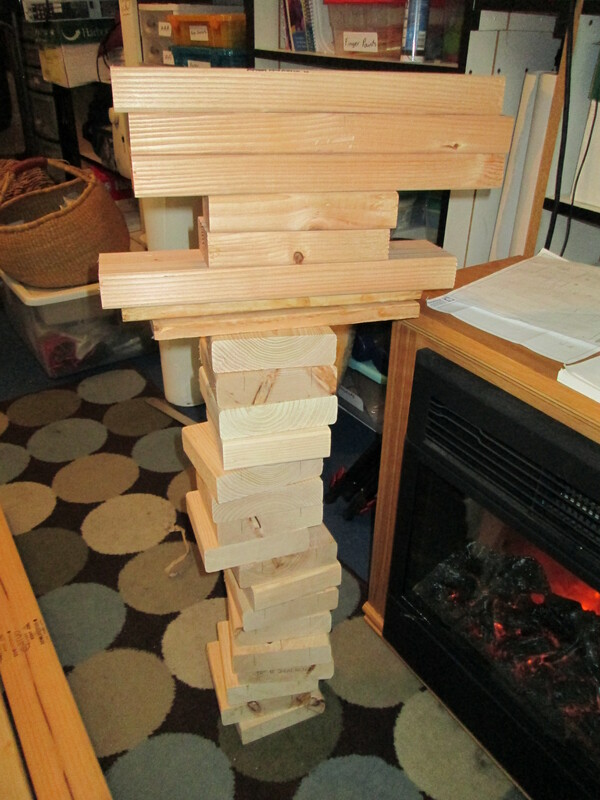 I turned my back for a moment and found this artful arrangement of building materials had somehow appeared. Hmmm… either we have a poltergeist or it may be my “helpers” again. This has been a massive learning experience. While my bed construction is a tad on the crude side, it has so far proven as indestructible as I’d hoped. 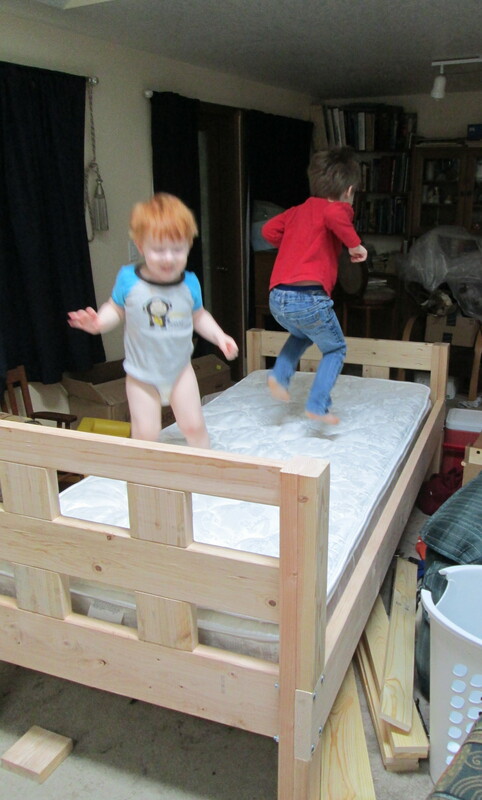 After I finished the frames I bolted them together and let the boys torture test Josh’s bed for a bit. It helped show me a few areas that I needed to improve and I made modifications based on that. Let the testing begin! It’s not everyday Dad sets up a twin bed in the living room. The boys take advantage and bounce as much as possible. I’m getting closer to the finish line on the great furniture debacle of 2014. The beds have been made and then disassembled ready for sanding and stain, and I’ve nearly completed the staircase (with dresser drawers under each step) so it will get sanded and stained tomorrow as well. Testing for fit. These are the stairs that Zack will use to get into his loft bed. Once the beds are finished and assembled I’ll post an in depth blog detailing their design and construction. I’m keeping my fingers crossed I’ll make it. I have three more days to push through the pain in my arm and do as much as I can with two crazed little boys under foot. 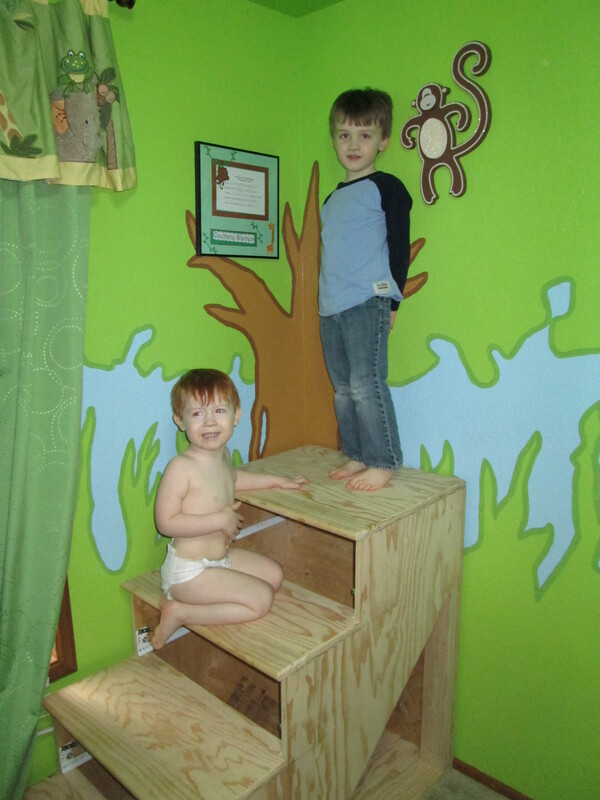 This entry was posted in DIY, Parenting and tagged arm surgery, bed stairs, DIY kids bed, frustration, kids furniture, loft bed by Brian Husted. Bookmark the permalink.